Apple CEO Tim Cook said on Tuesday that Apple will not create a new, inexpensive iPhone just for the sake of offering a cheaper alternative. With the focus of the company being on creating great products, Apple will not make a smartphone that does not past the quality test – that’s what Tim Cook announced during a webcast from the Goldman Sachs Technology and Internet conference, held in San Francisco. "We are making moves to make things more affordable. When we came out with iPod it was $399, today you can buy an iPod Shuffle for $49. Instead of saying how can we cheapen this iPod to get it lower, we said how can we do a great product, and we were able to do that. The same thing, but in a different concept in some ways. That said, if you look at what we've done to appeal to people who are more price sensitive, we lowered the price for iPhone 4 and iPhone 4S, and in the December quarter, we didn't have enough supply of iPhone 4, so it surprised us as to the level of demand we had for it. There are other companies that do that, that's not who we are," Tim Cook said. "Our North Star is great products." Decreasing the price on older iDevice models is just one of the attitudes Apple is taking to reach out to price-sensitive consumers. It's not easy to balance quality and price, and that's when novelty comes into action and new products could be created to meet the demand, he added. Apple CEO also mentioned the potential of its company to grow in the smartphone market, and mentioned that the market share of the Cupertino Company has not flattened in the wake of increased competition. With the smartphone market being about 700 million units and being projected to double in a few years, iPhone is available to only 50 percent of subscribers, so it has a huge market to tap into. Cook also reported that the 500 million iPhones shipped from 2007 to the end of last year, with 40 percent of the iPhones shipping in the last year, and 47.8 million shipping in the last fiscal quarter. 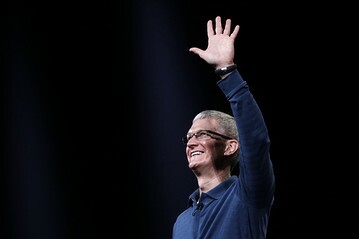 Cook added that his company will not deviate from the route of acquiring companies as it builds products, however with the extreme attention when choosing the larger ones - "we have looked at large companies. In each case we have done that thus far, it didn't pass our test," he said, "we will do more [acquisitions], we are constantly looking in the market. Cash is not burning a hole in our pocket."